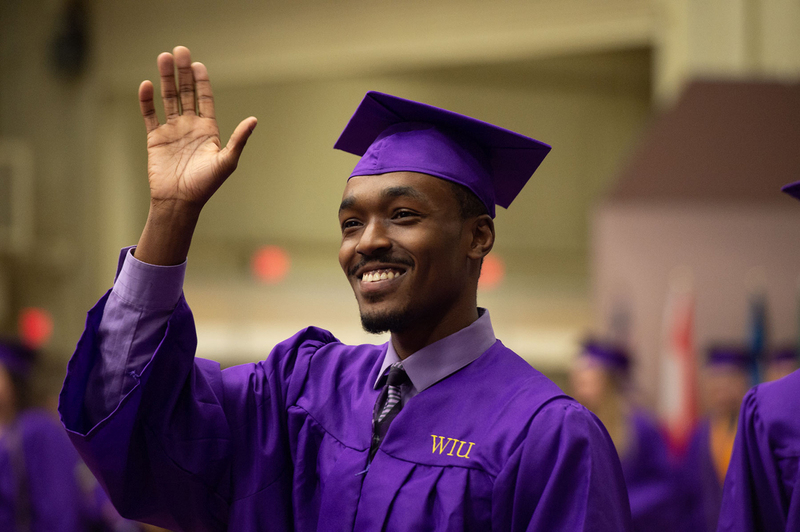 MACOMB, IL - Ceremonies recognizing the academic and personal accomplishments of Western Illinois University students and alumni will be held Friday-Saturday, Dec. 14-15 in Macomb during Western's Fall 2018 Commencement Weekend. At 5:30 p.m. Friday, Dec. 14, the Academic Honors Convocation will be held in Western Hall. 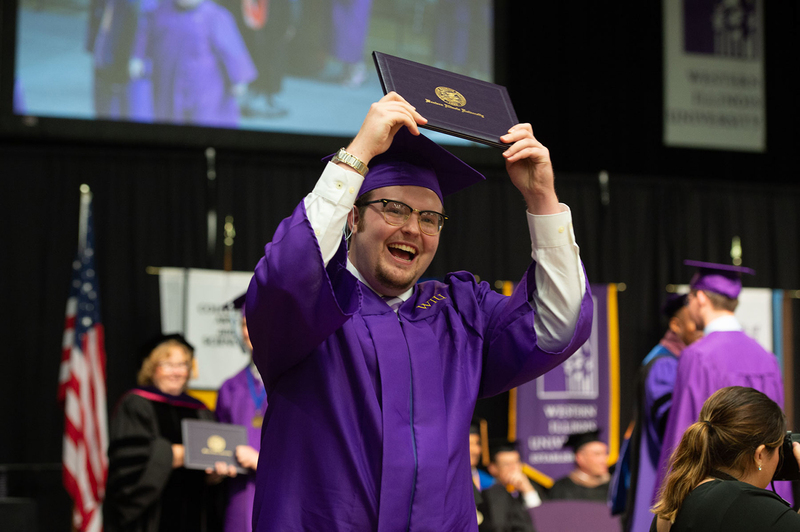 This ceremony recognizes college scholars, departmental scholars, honors scholars and candidates who have earned academic distinction throughout their undergraduate careers at Western. Students receive a medallion for each honor, which they wear at Saturday's Commencement ceremonies. The number of students eligible to participate in Fall 2018 Commencement Ceremonies — scheduled for 9:30 a.m. and 1 p.m. Saturday, Dec. 15 in Western Hall — is 848, which includes nearly 539 undergraduate students, of which 90 students are in the Bachelor of Arts in General Studies degree program (formerly the Board of Trustees Bachelor of Arts degree program), as well as 210 master's-level graduate students and nine students earning their doctorate degrees in educational leadership (Ed.D.) — they are: Kimberly Dayl Dorsey (Sherrard, IL); Adam Nathaniel Ehrman (New Berlin, IL); Brian D. Graber (Western Springs, IL); Darryl Hogue (Morrison, IL); Kurt A. Johansen (Batavia, IL); James M. McKay (Lake Villa, IL); Felicia Renee McKinnon (Indian Trail, NC); Sara Beth Sapp (Monroe City, MO); and Nicholas Dean Sutton (Toulon, IL). The combined ceremonies will include presenting graduating seniors their diploma covers and hooding graduate degree candidates. 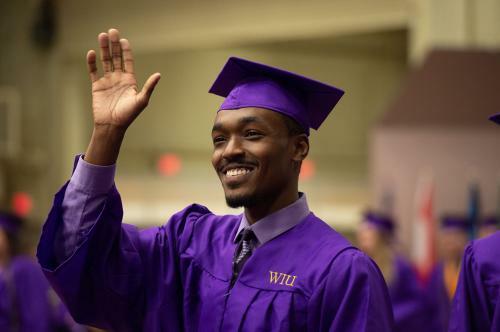 The outstanding accomplishments of five WIU graduates will be recognized during Saturday's Commencement ceremonies. This year's Alumni Achievement recipients are Randall S. Germeraad, a 1975 education graduate, who is the executive chairman of Springfield Electric Company; James G. Leahy, a 1985 business graduate, who is the chief operating officer for the Veterans Canteen Services (VCS), Department of Veterans Affairs (VA); Suzan Nash, a 1980 Master of Science in recreation, park and tourism administration (RPTA) graduate, who is the former executive director of Western Illinois Regional Council; Dennis R. Papini, a 1979 psychology graduate, who is the provost and vice chancellor for academic affairs at the University of Illinois Springfield; and Michael G. Steelman, a 1975 political science graduate, who is the chairman of the board of directors of the Federal Home Loan Bank of Chicago. Leahy, Papini and Steelman will be recognized during the 9:30 a.m. ceremony, and Germeraad and Nash will be recognized during the 1 p.m. ceremony. One Army ROTC cadet will be commissioned to the Illinois National Guard as a second lieutenant in the U.S. Army. College, Honors and Departmental Scholars and students with academic distinction based on grade point average (GPA) will receive a medallion for each academic honor. Interim Provost and Academic Vice President Kathleen Neumann will serve as master of ceremonies for the convocation ceremony and each commencement ceremony. Greetings will be given by Carolyn Ehlert Fuller, chair of the WIU Board of Trustees, for each ceremony. President Jack Thomas will deliver remarks to the graduating class. Graduating senior Benjamin Adam Rogers, an honors scholar in music, is the convocation speaker and will deliver his speech "Be the Change You Want to See in the World." Rogers, of Savanna, IL, is also the national anthem singer. Marshals are: Gabrielle Bandovich (Roselle, IL), law enforcement and justice administration (LEJA); Nancy Davila (Gages Lake, IL), LEJA; Shea Fili (London Mills, IL) foreign languages and cultures; Rome Hamm (Macomb), finance; Quinten Hayes (Vermont, IL), exercise science; and Randolph Turkington (Aurora, IL), psychology. President Thomas will present remarks to the graduating class at the 9:30 a.m. and 1 p.m. ceremonies. The 2018 Distinguished Faculty Lecturer, WIU Professor of Management and Marketing Rajeev Sawhney, will be recognized at each ceremony. The Western Illinois University Wind Ensemble, under the direction of Mike Fansler, conductor, will perform the music, and Alison Faye Huntley (Quincy, IL), music graduate student, will sing the national anthem at the 9:30 a.m. ceremony. Rogers will sing the National Anthem at the 1 p.m. ceremony. The 9:30 a.m. Commencement Ceremony will recognize graduate and undergraduate candidates in the College of Arts and Sciences and the College of Business and Technology, as well as candidates in the Bachelor of Arts in General Studies and in Interdisciplinary Studies. Leahy, Papini and Steelman will receive their Alumni Achievement awards. Marshals, who are graduating seniors selected from the top scholars earning high academic distinction, guide the graduating class, faculty and stage party from the processional to the recessional. They are: Riggs Baxter (Thorntown, IN) engineering technology; Alexandra Noel Berkman, (South Elgin, IL), psychology; Justin Michael Doty (Tremont, IL), computer science; Jamie Jeaneth Flores (Chicago), political science; Mariah Danielle Peters (Blue Springs, MO), accountancy; Erin Trybulec (Chicago), foreign languages and cultures; Tess Nicole Tyler (Pleasant Plains, IL), English; and Rebecca Lindsey Worthington (Rushville, IL), biology. 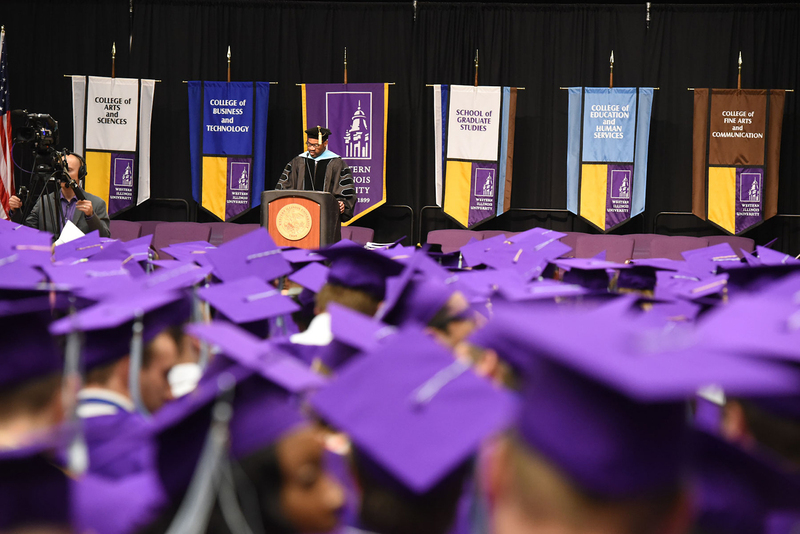 The 1 p.m. Commencement ceremony will recognize the Doctorate in Educational Leadership candidates and graduate and undergraduate candidates in the College of Education and Human Services and the College of Fine Arts and Communication. Germeraad and Nash will receive their Alumni Achievement Awards. Marshals are: Amy Lynn Borgstede (St. Charles, MO), RPTA; Laken Crystal Burnett (Petersburg, IL), LEJA; Kathryn Lynn Ferguson (Cedar Rapids, IA), theatre; Megan Kleinschmidt (Palatine, IL), English as a second language and foreign languages and cultures double major; Kaylee Kristen Kramer (Villa Park, IL), special education; Chloe Cassandra Layne (Saint Charles, IL), LEJA; Rogers (Savanna, IL), music education; and Madison Nicole Thielsen (Naperville, IL), music education. The flags of 14 nations represented by the Fall 2018 graduating class will be displayed in the arena. Sponsored by Western's Center for International Studies, the flags represent the following countries: The Bahamas, Bangladesh, China, France, Ghana, India, Jamaica, Nepal, Nigeria, Pakistan, Saudi Arabia, South Korea, Sri Lanka and the United States. Western Illinois University was home to students from 62 countries during the Fall 2018 semester. 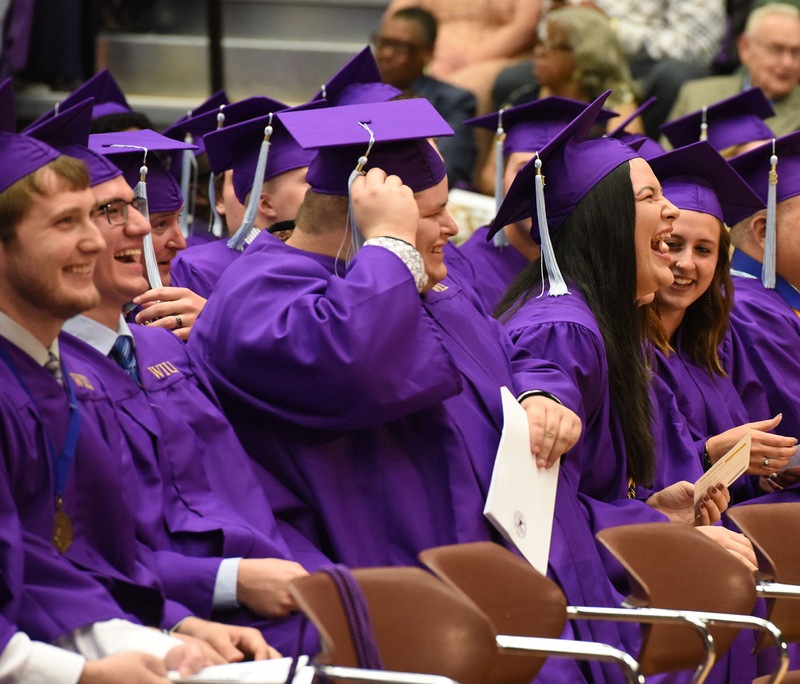 Western's University Television (UTV) will broadcast the Academic Honors Convocation and each Commencement ceremony live on Macomb's cable channel 3. The Macomb ceremonies will also be streamed live on the web. A link to the web broadcast will be available from Western's homepage (wiu.edu) during the time of the ceremonies. DVDs of the ceremonies may be purchased through UTV, telephone (309) 298-1880. Photographs of each graduate will be taken as they receive their diploma covers. Proof sheets will be mailed from Western's Visual Production Center to each graduate, with instructions for ordering photos. Ceremonies are open to family and friends of the graduates. Tickets are not required; seating is on a first come basis. Doors open 90 minutes before each ceremony. An interpreter will sign each ceremony and assistive listening devices will be available to the public at the information table in the north lobby of Western Hall. 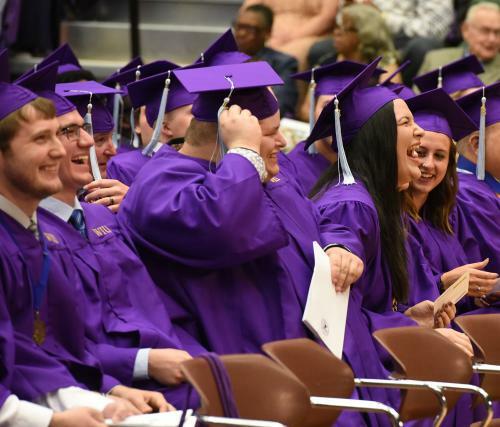 There are a limited number of disability seats, and individuals in need of special accommodations for the ceremonies should contact Western's Office of Equal Opportunity and Access at (309) 298-1977. Office hours are 8 a.m.- 4:30 p.m. weekdays. For more information, visit wiu.edu/commencement.